A great white shark enjoying a giant piece of beef jerky off the coast of South Africa Credit Oberto. TAMPA, FL -- A beef jerky company has put its product to the ultimate test: Would a great white shark prefer a giant beef jerky over a seal? A new video released by Oberto Beef Jerky appears to answer the question, and it seems the hungry great white sharks off the South Africa coast prefer a jerky snack. The team at Oberto Beef Jerky claims the video was shot in False Bay near Cape Town, South Africa in late April, which is the start of the peak season for Great White activity. The bay itself extends from Cape of Good Hope to Cape Hangklip. Oberto's CEO and his expedition team trolled a giant piece of jerky around the region (the same way National Geographic and others have trolled seal decoys for a good seven hours from Cape of Good Hope down to Danger Point in Gansbaai)- passing Seal Island and "Shark Alley," the area between Dyer Island and Geyser Rock. In addition to there being an abundance of seals in the area, the Great Whites exhibit a unique behavior in this location. Scientists believe that due to the incredible depths very close to where the seals are entering and exciting the water on the rocks, the Great Whites have learned that they can spy their prey above and then shoot up like a missile, taking the seal by total surprise. 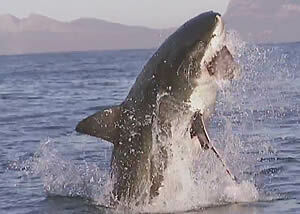 The strike of this Great White happened around 2PM- after several hours at sea. The Oberto team says it didn't know whether this quest had any chance of success, but it put in its best piece of Oberto Beef Jerky, and got a video that it couldn't possibly imagine.